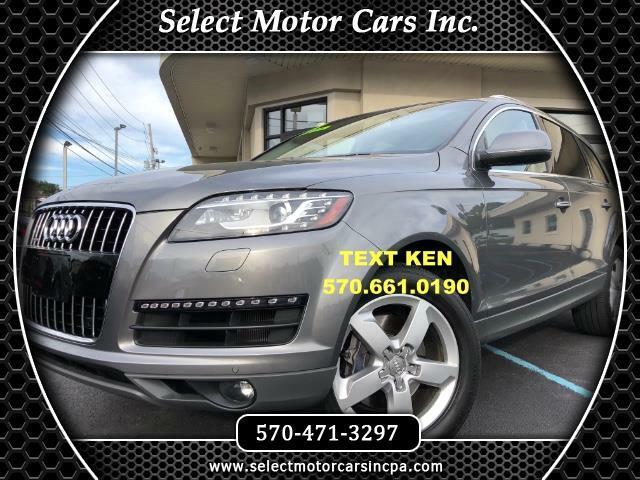 Used 2013 Audi Q7 3.0 Premium Plus Quattro for Sale in Moosic PA 18507 Select Motor Cars Inc.
QUATTRO ALL WHEEL DRIVE PREMIUM PLUS NAVIGATION 3RD ROW XENONS SIRIUS PANO ROOF 49K W/WARRANTY! Just came in 2013 Audi Q7 3.0T Quattro AWD Premium Plus in gorgeous Graphite Grey Metallic exterior with Black interior. Features include 3.0L turbocharged engine,automatic transmission,Quattro All Wheel Drive,Premium Plus trim package,18" wheels,LED daytime running lights,xenon headlamps,headlamp washers,front & rear park distance control,keyless entry,privacy tint,power trunk lid,panoramic sunroof,fog lamps,dual power heated mirrors,blind spot assist,aluminum roof rails,dual exhaust,rear spoiler, premium leather interior,dual power seats,front & rear heated seats,power lumbar support,memory package,wood trim,steering wheel controls,heated steering wheel,on board computer,auto headlamps,dual zone climate control,3rd row seating,rear cargo cover, Navigation system,rearview backup camera,Bose sound system,cd player,sirius satellite radio,bluetooth connectivity,auxiliary input,auto dimming mirrors,homelink,center console,cupholders,amongst many other great features.